After several years of hosting my mobile application's web server and services with Amazon Web Services (AWS), in April I moved my production services to Windows Azure, and it went really smoothly. Here I am sharing a guide through some of the highlights of this process, including how I went about migrating my Node.js backend to an HTTPS-secured site powered by Windows Azure Web Sites, Cloud Services, and the Windows Azure Store. Update 6/18/13: Windows Azure Web Sites now supports custom SSL certificates without the Cloud Services workarounds described in this post. The new post is up at http://www.jeff.wilcox.name/2013/06/waz-web-sites-ssl/. After planning for the migration in March and doing some testing over weekends, I migrated all the traffic for my foursquare application 4th & Mayor to Windows Azure via a quick DNS update a few days into the month of April. It has continued running without a hitch. I'm not going to detail my data migration here, however, that is never fun. As my cloud backend is implemented in Node.js, there was not very little app coding work required other than updating my logging provider and configuring some new infrastructure connection strings. My app makes connections to my cloud infrastructure to enable rich live tiles, push notification registration and processing, configuraton, and other future scenarios I hope to launch some day in future app updates. These requests need to be secured with SSL. I also expose some functionality on the web site for the app's marketing and user diagnostics. Here's the kicker: the Windows Azure Web Sites preview product supports SSL using Microsoft's wildcard certificate for *.azurewebsites.net - great and secure for many apps today - but does not support a "bring your own certificate" model today. In time, the service will support custom certificates for Web Sites via SNI I've heard, but today you cannot bring your own certs like you might like to. Since my production app already uses my own custom certificates, moving my traffic to the Windows Azure endpoints isn't a great story for me, and I prefer to route my app traffic through DNS for my domain. 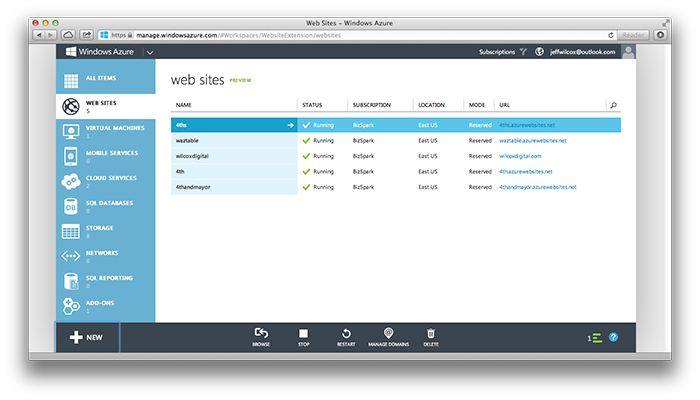 Brady Gaster has a really good solution and tutorial for the interim: Running SSL with Windows Azure Web Sites Today - this is what I have gone with, and though it is a little scary sounding at first, it was pretty easy to setup and has completely unblocked me. Check that out for the technical details and guide. Production 4th & Mayor app and site traffic as of April 4, 2013 is using SSL to communicate with the awesome Git-deployed goodness of Windows Azure Web Sites. WINNING! I can independently scale the Cloud Services (reverse proxy) and reserved Web Sites instances for the front end. Since I host a few other sites with my reserved region/subscription, I tend to keep more instances there for good response times across my network of sites. Since both Windows Azure Web Sites and Cloud Services have built-in network load balancing (this is a difference from when I was with AWS and had to pay for and configure elastic load balancing separately), I get a nice value out of this configuration. Full disclosure: I'm a software development lead on the Windows Azure team and looked to this exercise to learn more about the tools, products and services that we offer. My application is a member of the Microsoft BizSpark program which offers a nice set of cloud services, too. Implemented in Node.js, the web services and site for the app are super portable as a result: I'm glad there is great support for Node on Windows and Windows Azure. I also use some secondary services like MongoDB hosting (provided by the MongoLab company) and table/blob storage, and a nice thing of this infrastructure world is that I can move and migrate them as I please - it isn't all strongly coupled and is just a matter of identifying resources the right way and having the appropriate credentials available to my app, wherever it may live. When hosted in the AWS cloud, I was using pure infrastructure services, and though I loved that level of control, keeping my VMs up-to-date just wasn't that fun. The huge benefit with this migration is that I've moved to the nice deployment model that Windows Azure Web Sites offers - reducing the complexity in scaling and provisioning new virtual machines. Although not exactly the same as Web Sites, Amazon's Elastic Beanstalk product is pretty similar in some ways in terms of enabling a much better deployment model, FYI. The source code to my simple Node backend is open on GitHub at https://github.com/jeffwilcox/4th-cloud. 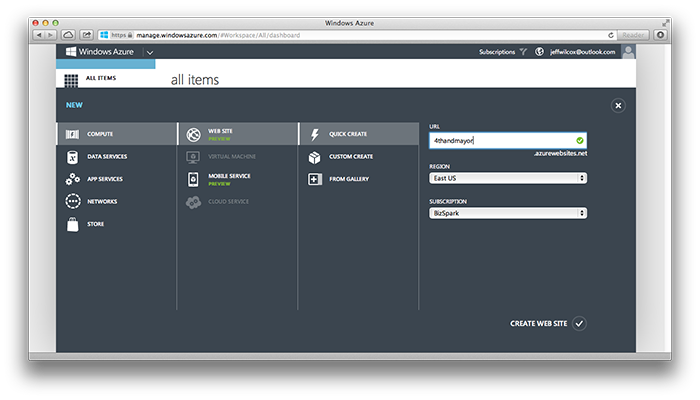 Like anything else in Windows Azure, I just open up the "New" menu, pick Compute, and then Web Site. I'm hosting my own app and don't need a starting place, so Quick Create is the way to go. I choose which Windows Azure subscription I would like to use for the service's billing. Once the site is created, clicking on it in the portal will bring up its dashboard display where you can get deployment info, monitor data transfer and various instance and site metrics, plus perform configuration & administrative tasks. Here's the 4th & Mayor dashboard showing a week of data - each day you can see clear ebb and flow. To make the source control association for a site, from the dashboard, touch 'Set up deployment from source control' and make your selection. It will then let you setup credentials for Git or authenticate with services like CodePlex or GitHub.com. For my app, I'm using Local Git repository - I do some magic w.r.t. generating a JSON file with configuration information that I need to deploy in secret to the app, so I need to do this magic before pushing the site and service. This enables a good workflow for me, but for other web sites I host, I often just have them deployed straight from my source control. 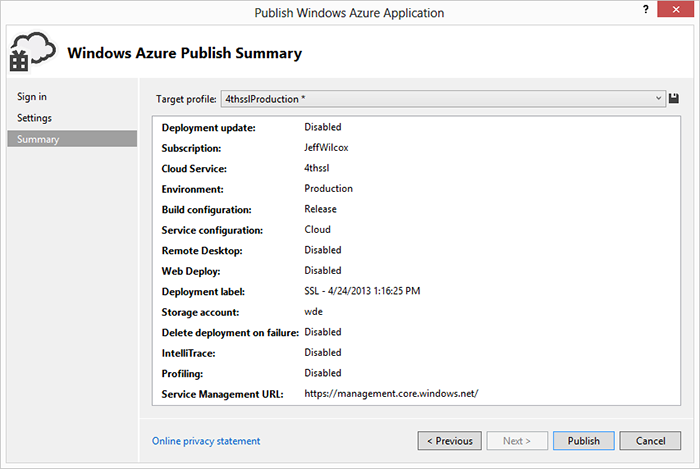 So now, from a local repo, I can do a git push azureproduction or similar command to get my site updated in seconds. The first time you configure local Git deployment, the management portal will help you setup some credentials to pushing, fyi. There are a lot of nice tutorials out there that go into detail if you need. Once configured, I setup the Git remotes inside my repo. 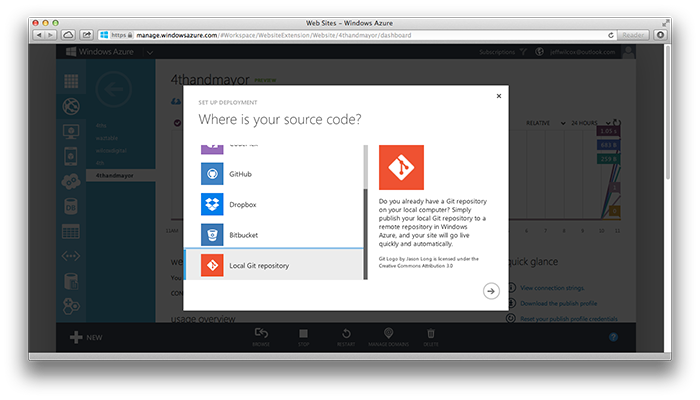 The Azure portal should show you the command for this - but essentially you just issue a git remote add command to enable pushing to that endpoint. When you push to the Git endpoint in the Azure cloud, a service called "Kudu" picks up the changes and redeploys the application. You can find out more about Kudu at David Ebbo's blog - he is the architect of that product. If something went wrong, the UI is available to help roll back to an earlier version in seconds, too. The Free and Shared tiers of service for Windows Azure Web Sites are all great products; however, having a decent amount of traffic at times, I need to be able to scale and make sure that I have the right amount of resources available to my application. I'm using the Reserved web site mode which lets me actually associate a few complete virtual machine instances with all of my Web Sites in a region/subscription pair. If you go to the "SCALE" tab in the management portal, you can scale your site to the Reserved mode, and even set the number and size of VM instances to use in the Reserved mode. This lets me share my costs for dedicated VM hosting among all my web properties in a subscription, and also helps me make sure that my response times and available computing power are always there. My costs so far have been similar to those I had in AWS, though I have the benefit of being able to pool multiple sites on these instances, instead of before, when I would spin up a few EC2 instances and then have to pay for a load balancer (ELB) between the instances. 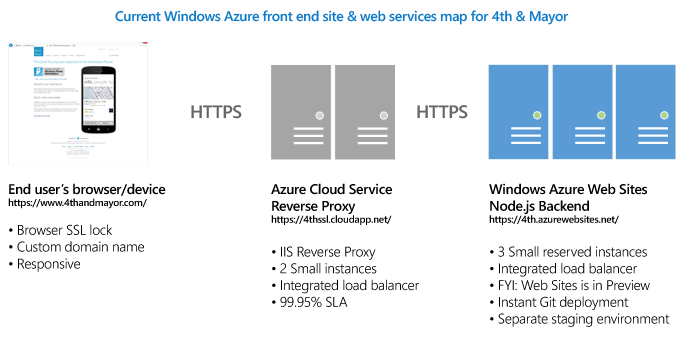 Load balancing is included at no additional cost with Windows Azure Web Sites and Cloud Services, which is great. Because of a workaround that I need to do for custom SSL today, however, I have similar costs as before since I am running a separate reverse proxy for encryption purposes. This cost will disappear once new functionality launches for web sites some day. 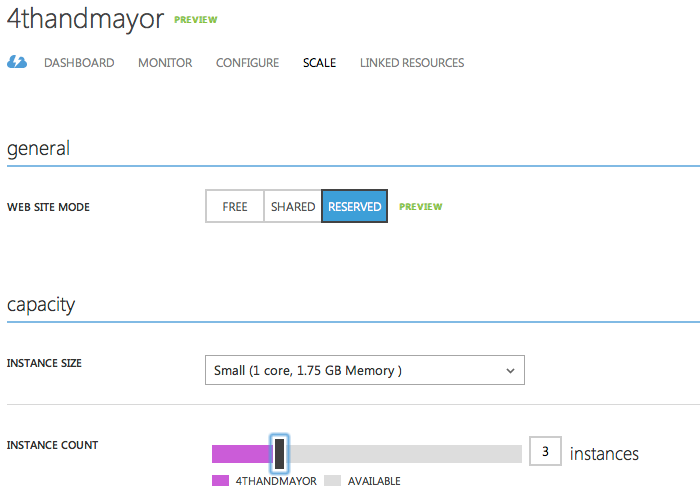 I prefer the standard Small instance types in Windows Azure right now - these are essentially single core VMs. Right now I'm using 3 small instances. Since "Small" is the default unit for billing in the Azure world, it also is pretty straightforward for me to understand where my cloud spend is going with these units. Instance numbers and scale mode for my Web Site is configured in Configuration tab for the app. Just slide the Instance Count bar to the right to ramp up the instances. Thanks to the underlying technical implementation of the Web Sites system, these scaling operations are often extremely quick and instantaneous - there are virtual machines standing by, more or less, for my scale. I get more traffic at night and weekends across the US (about half of my user base), and have thought about automating the scale up and down work on this schedule using the Windows Azure PowerShell or cross-platform command line tools for my Mac... but for now I am doing this by hand. When I go and view all my Web Sites now, I can check and see that the 'Mode' column clearly shows Reserved. Setting environment variables, logging, etc. It is very easy to set environment variables that will be exposed to your application hosted via Web Sites. On the Configuration tab in the management portal, you can add key/value string pairs that will be exposed - and these can be changed on the fly, too. A common configuration variable for Node.js apps is the NODE_ENV setting - when set to "production", the Express framework/module that exposes the web services & site will configure its error and diagnostics system in a way that will be efficient for production use. Simply add the key/value pair in the UI in a blank space and then press the Save button in the bottom menu for the site. It should update all the running instances pretty quickly. My app also is designed to be run in one of 3 ways: dev, staging, and production; by setting a custom MODE environment variable, I then have the startup path for the app load the appropriate configuration file with cloud credentials and other data. I actually have several Windows Azure Web Sites running for the app: the production app, a staging app, etc. Since they are all nearly mirrors of one another, it is very easy to use this configuration system to control the runtime environment. For logging, my app uses a common log provider that many Node apps use, with a custom adapter I wrote that stores this information in the Windows Azure table service. More on that another day & post. 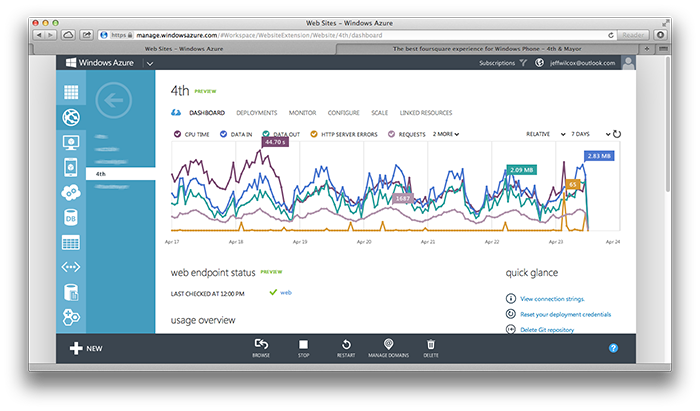 There is a preview feature in Web Sites called Endpoint Monitoring that lets you pick a few test data centers and a URL to your application. The service then periodically pings your URL, records the response time (or error if it cannot connect), and makes this info available in the portal. On the Configuration tab you just give the metric a name, URL, and pick a one or more locations and press Save. This, combined with the built-in diagnostics information the Web Sites gathers and shows for all sites and no cost, is a really nice alternative to Amazon CloudWatch metrics I believe. I use MongoDB for storing a lot of information about push notifications and app users. Mongo has been a great experience for me. Everyone has their own opinions on NoSQL but Mongo has been working great in production for me for years. I've found hosted Mongo to be relatively inexpensive yet super powerful: I use a third-party shared MongoDB hosting provider, MongoLab, so I don't have to worry about devops. In my previous AWS infrastructure setup, I had a paid product (about $40 a month) in the AWS US-East-1 region that I paid MongoLab for directly. 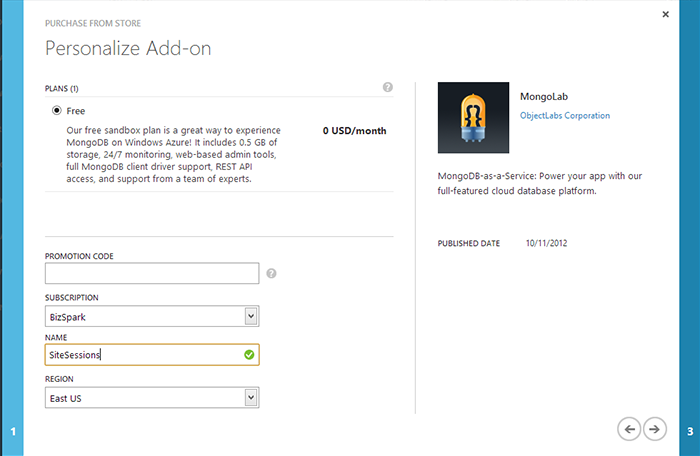 Windows Azure also has MongoLab and hosted Mongo support. 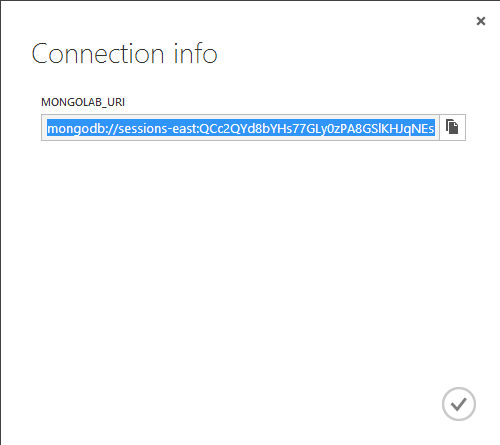 MongoLab just makes things easy, you no longer have to worry about actually running the database (devops, etc.) and just use the connection info and let them manage the service. The MongoLab hosting service is available free today (for a 500MB max MongoDB shared instance) - yup - $0.00 per month. Awesome. This is enough capacity for my needs today and then some. The Windows Azure Store exposes 3rd party providers and resources like this to me and actually lets me use my existing Azure billing information if the product is paid - no need to setup a separate billing relationship like when I was using MongoLab + AWS. 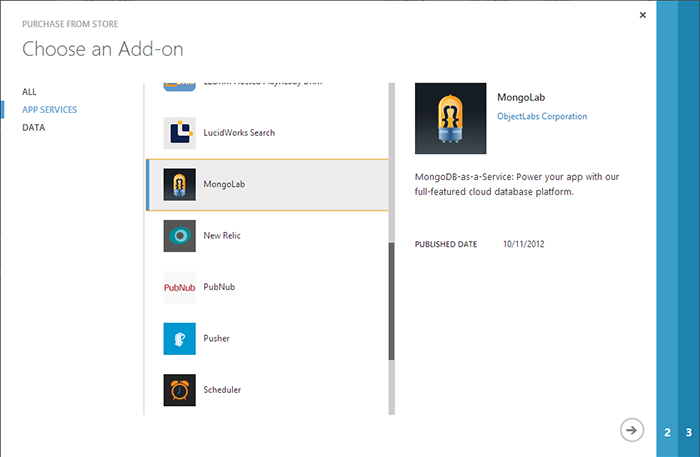 To use such a resource, just like creating any other service inside the management portal, I go to New, Add-ons, then find the MongoLab service under App Services. Then you can setup information about the service, read about what is included, functionality, configuring it, etc. For now I pick the Free plan, select the associated subscription and region, then give it a name. Once it is created (this took about 60 seconds for me when I recently tried), you highlight the service and the contextual toolbar at the bottom of the portal will update. Just go ahead and hit Connection Info, and the connection string you will use is there. The connection is open to the web, so you can use the Mongo tools locally or from the cloud to copy and migrate, or backup, data. Today (April 29, 2013), the Windows Azure Web Sites product supports SSL, but not the kind that I need in order to be backwards compatible with my existing production deployment on Amazon that uses my own SSL certificates for www.4thandmayor.com endpoints. Reading through previous posts about the Web Sites preview functionality, in time there will be support for SNI SSL, but this functionality is not available today. The complete post at http://www.bradygaster.com/running-ssl-with-azure-web-sites is a good reference and you should follow that. This is just a short summary of some of the challenges/process. For setting up the SSL reverse proxy with custom certificates I need to use my Windows workstation, Visual Studio 2012, and the Windows Azure SDK for Visual Studio today. Most web developers have been through this dance a few times - I've used Comodo and other reseller-friendly certificate services in the past through GoDaddy and NameCheap. Most of the cheap certs are just fine and verify that you control the domain name in question. If you're looking for the fancy "green" security bar though, you'll need an EV cert and those typically actually have a much more involved verification process - for an LLC they will check records in D&B, perhaps require proof of a corporate bank account, look for legal documentation or business licenses, etc. 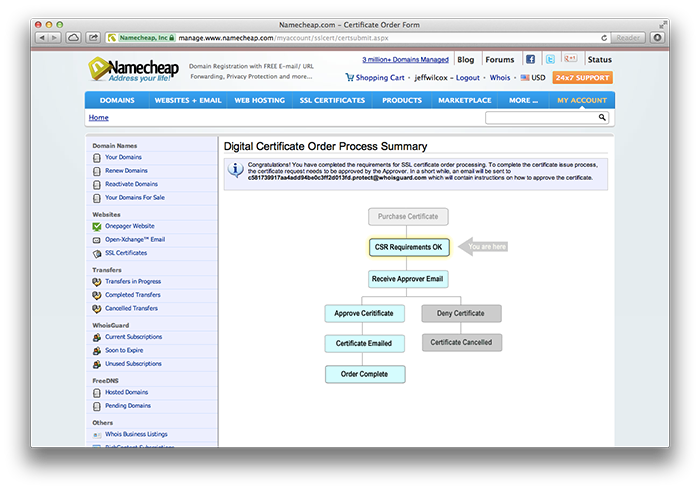 I don't require EV/green trust bar so I'm not covering that process - I am just using a domain control-validated cert. When you get a signing certificate, you never have to transmit the private key to the certificate authority - instead, you just send a .CSR file - a signing request. To generate this, I'm most familiar with OpenSSL. For 4th & Mayor, I moved this year from a standard certificate (for just the www.4thandmayor.com URL) to a wildcard certificate (*.4thandmayor.com, includes any subdomain) - this allows me to secure endpoints like api.4thandmayor.com and staging.4thandmayor.com as well. The wildcard cert did cost about $100 more per year. 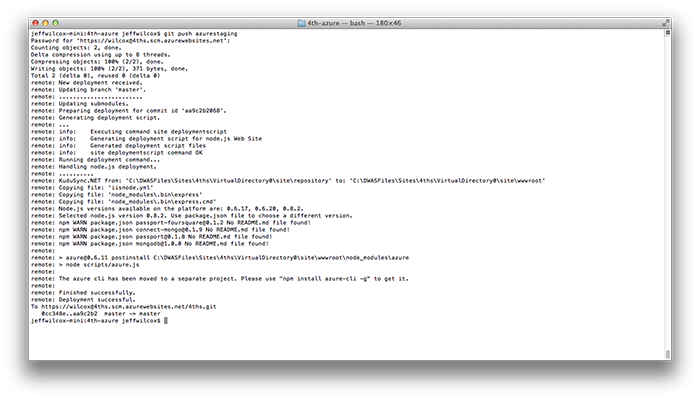 Fun Windows trick: if you have the Git Bash installed, just run it - openssl is available in the command prompt. It will then generate and save the .key file - save that - it is your private key - keep it safe, like Frodo would. The .CSR file is just a text file with the appropriate headers and base64-encoded key; this is part of the PKCS #12 format specification. 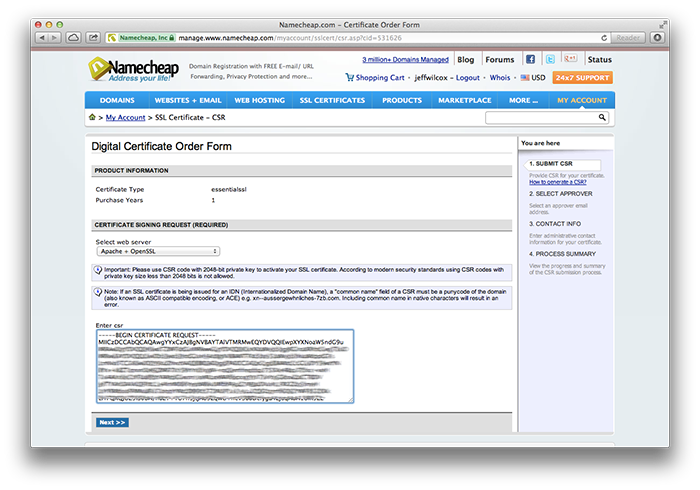 Just open, copy and drop the file into your SSL certificate order form as part of the checkout and ordering process. Most providers allow unlimited "re-keying" these days, in case you make a mistake, but do use care in these steps. At this point you'll just wait for the verification process and then be able to download the certificate and any needed intermediate chain to then install on your web servers or your cloud service. Most services send an e-mail with information about grabbing the chain once validated, approved and generated. 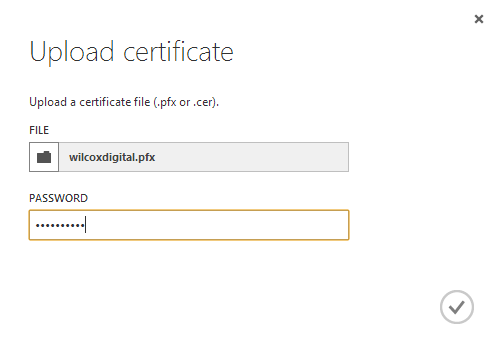 As I was making the request on my Mac initially (Windows may be different), I needed to generate a single .PFX file which contains the private key, certificate, any intermediate certs, and ideally/optionally a password to protect it all. Since my EssentialSSL-branded certificate is actually built on the trust of a few intermediate CAs and resellers, you need the full chain to effectively validate the cert in the end. I munged these things using OpenSSL. Note that these are the commands I used, but every CA is going to be a little different depending on any intermediate certificate names, etc..
Next, export/generate the PFX file... it will prompt you for a password, too. Provide a password. Keep this file safe. Super safe. It has your private key, certificate, and everything in it. 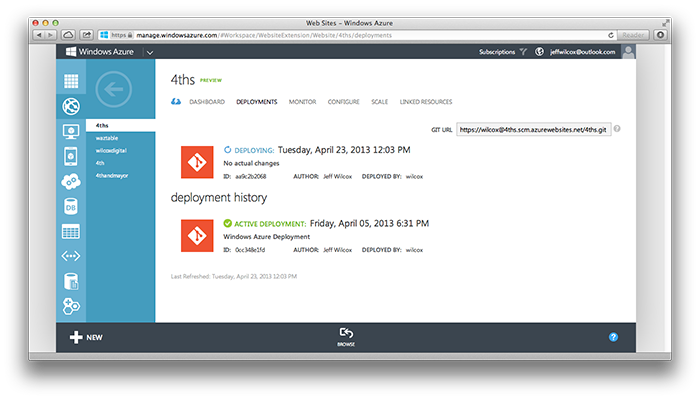 You'll upload it to Windows Azure soon. I have a deployed Web Site that has my Node.js app running in the cloud. It is scaled using a reserved model, multiple VMs, and ready for traffic. I've configured my application's connecting strings, settings, etc. So again, the biggest functionality gap in the preview Web Sites feature for my needs here is that I just cannot use my custom domain SSL certificate without a workaround. The workaround is detailed in other posts, but is essentially a Web Role Cloud Service, which is the strongly managed, powerful application model that is a key Windows Azure service. You can find out more about Cloud Services and the compute application models that Windows Azure supports at http://www.windowsazure.com/en-us/develop/net/fundamentals/compute/. Cloud Services provides Platform as a Service (PaaS). This technology is designed to support applications that are scalable, reliable, and cheap to operate. It’s also meant to free developers from worrying about managing the platform they’re using, letting them focus entirely on their applications. Like the other services, in the management portal I select New, Compute, and setup details like the Cloud Services endpoint. Once setup, I will know the DNS name (ending in cloudapp.net) and have a placeholder project that I can then upload and deploy staging and production packages to. 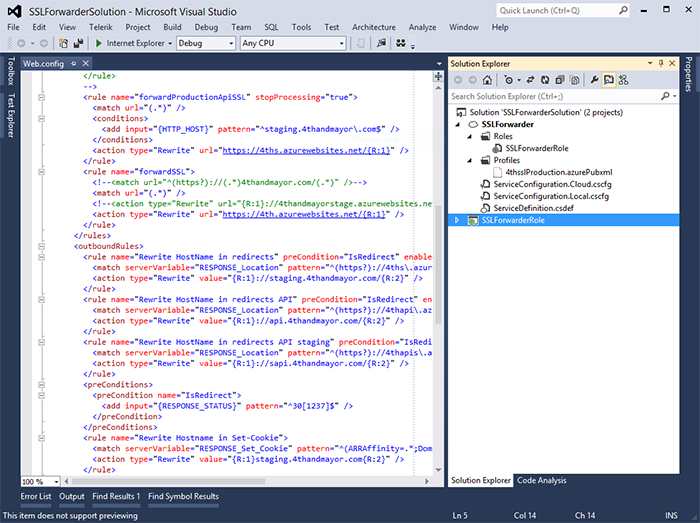 The Visual Studio and PowerShell tools on Windows generate these deployment packages. The Certificates tab for the creatd Cloud Service is where I can go to view information about any certificates that are available to my app. In the app bar at the bottom of the page, I select Upload. Browsing my machine for my safely secured .pfx file, I also provide the password to decrypt the contents. After the certificate PFX bundle is uploaded, the Certificates area will show a table listing all the certificates that it was able to extract, including the Subject, Status, Thumbprint, and expiration information. I will use the thumbprint of these while configuring the cloud service in Visual Studio so that the proper URL endpoints use the right certificate, and also to provide the certificate chain for the cloud services hosting environment to use during SSL/TLS negotiation. The actual reverse proxy is detailed in Brady's post, it builds on a Microsoft IIS-built component called Application Request Routing. Once setup with the basics for deploying the ARR, etc., I need to configure the app specifics. ARR will essentially request the secure 4thandmayor.azurewebsites.net content, re-encrypt it with my custom cert, and pass it along. It also will rewrite any URLs, cookies, etc. so that things work and appear properly. First, I update the ServiceConfiguration.Cloud.cscfg file. This essentially is a mapping between the service and how I want it configured both when using locally, or when deployed to the placeholder Cloud Service I've already setup. In the file I provide the thumbprints and helpful names I give to the certificates I will be referring to. Then, inside the Web.config file, I actually setup the routing rules that ARR understands for rewriting hostnames, cookies, etc. This uses regular expressions. Finally, I build the project, it does some basic configuration file checking, and then walk through the Publish Windows Azure Application dialogs in Visual Studio. I publish the service to the Production environment, configure a few things, and in 15-20 minutes or so the Cloud Service is published and live for me to do some testing with. Since I have not updated my DNS endpoints yet, I can test the app independently (even using a local hosts file for example) to see that things are behaving as I expect before I move production traffic over. Once my Cloud Service is deployed and I am happy with how it is routing and encrypting traffic between itself and my client machine, I want to get ready to do things for real. In the Scale section of the management experience, I bump the service up to 2 roles. I hit Save. This will provision and configure another machine in the cloud. This is essential in the Windows Azure world to make sure that my app is available, since this is a single point of potential failure between all of my users and Web Sites (it sits between them). The Windows Azure SLA (review the legal details here http://www.windowsazure.com/en-us/support/legal/sla/) essentially requires the 2 instances, allowing Azure itself to manage the platform as a service, install patches, etc. This also will make sure that I have the network bandwidth and computing power to host all my site information. Before April, I actually had the application deployed both on Amazon and Microsoft's clouds using DNS round robin for a while, helping me make sure that I had a high level of confidence in the fault tolerance of my application. Flipping DNS to move all of my traffic to just the 4thssl.cloudapp.net endpoint is all that is left - that is the new Cloud Service that is running, sitting between my Windows Azure Web Site (which itself is load balanced with several virtual machines) and the end user. 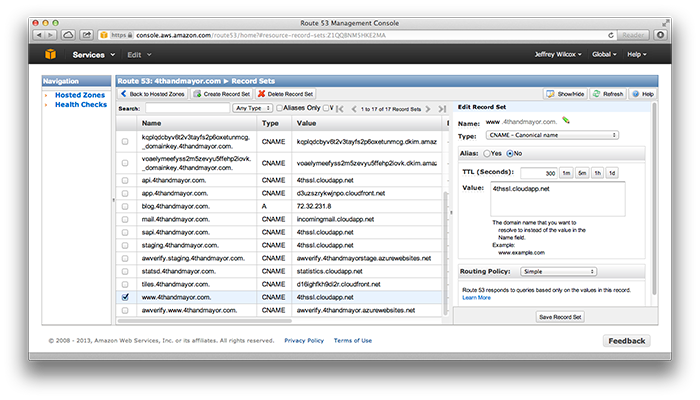 I continue to use Route 53, Amazon's DNS product, and inside their service editor I'm able to update the CNAME entry for my www.4thandmayor.com endpoint to move to the new cloudapp.net service. I press Save Record Set, and within the TTL window, most clients will begin to have the service through Windows Azure instead of AWS. I kept the original EC2 instances and load balancer for my site running for a few days, monitoring traffic until I was sure that nearly all clients had the new DNS information. Then I went into the AWS portal and terminated a bunch of EC2 instances and deleted the load balancer. So, check it out - https://www.4thandmayor.com/, now hosted securely, powered by the simple Web Sites product, and it is fast! The Cloud Services workaround, using ARR to provide my own effective load balancing, will some day not be required. According to posts and comments Scott Guthrie has made on his blog in the past, eventually Web Sites will support the SNI/SSL protocol so that I can just upload my cert to the Web Site and have Azure take care of the rest. That will be nice! This solution will be a lot more affordable: the need to host your own set of cloud services reverse proxies will no longer be there. Can't wait for that! In the meantime, if custom SSL + Web Sites was holding you back, I hope with this post and (Brady Gaster's)[http://www.bradygaster.com/running-ssl-with-azure-web-sites], you will have the information you need to get unblocked. I hope you appreciated this long look at some of this change, all said and done, writing this blog post took longer than migrating my production application from AWS to Windows Azure... maybe I need to learn to type a little faster?